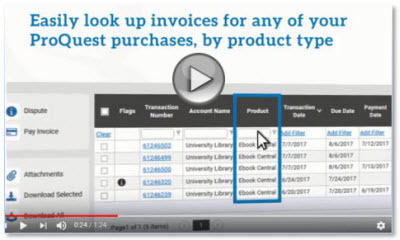 Ebook customers with ProQuest Deposit accounts can view balances, including pending transactions, for up-to-the-last hour of spend via LibCentral, without registering, but registration is recommended. Watch the videos. Find answers to questions. The easiest way to ensure that you enjoy uninterrupted access to your subscriptions as they will renew each year...with no action required from you. We'll EasyRenew and send you the invoice. Can't EasyRenew now? Sign up with RenewMe to renew with one click online. Renew for two or more years at once – you'll save time and may qualify for multi-year savings. If you are a library or system administrator, please register now for an account to submit and manage support cases and find answers covering all ProQuest products and technology services. Sign up today.